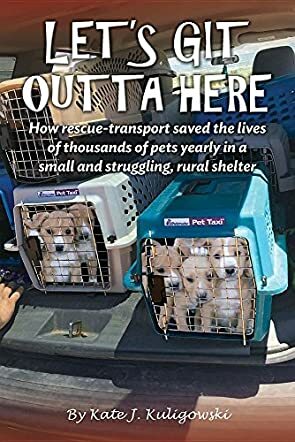 Let's Git Outta Here by Kate J. Kuligowski is an in-depth story about Valencia County Animal Shelter (VCAS), a once-respectable shelter overwhelmed by too many animals. As more animals arrived every day, the employees and volunteers became demoralized by the high rate of euthanasia, overcrowding, and illness. Without a solution, the VCAS was in dire shape until a new volunteer took over, determined to make a difference and save the shelter and the animals it took in. As this volunteer sought out solutions, new volunteers and employees joined in the battle in a county where animals were over-bred for fighting or dumped when unwanted. Between these situations and poor spay and neuter programs (plus other important programs), saving the VCAS was a difficult, uphill climb that needed just the right caring souls to achieve. In Let's Git Outta Here, Kate J. Kuligowski brings attention to issues that can be easy for many to ignore. Written with passion, this book reveals the caring and generosity of a compassionate group of people who understand how important each life is, even those of animals. Since humans have domesticated cats, dogs, and other animals, we sometimes think therefore if we stick them out in the wild, they’ll know how to take care of themselves instinctively. This just isn’t the case. Humans have a responsibility to these animals. They are not objects one can throw away when it becomes inconvenient or they have lost their value. I am so glad I read this book because it reminded me how important each life is and it has encouraged me to do more. Plus, it’s good to read about people making a change in this world. Kuligowski's writing is heart-wrenching and heart-warming. She approaches this difficult topic with honesty and passion but also with facts that make this more than an emotional story. It proves what people are capable of achieving when they join together.